When you start R.U.S.E. in Steam and you get an error like this (see below), how can you fix this. I give you the solution. Version : Final ACCESS VIOLATION (Reading 0x0000000c) ?Swap@GMatrix2D@@QAEXPAV1@@Z (0) ? ?0GImage@@QAE@ABV0@@Z (0) ? ?0GImage@@QAE@ABV0@@Z (0) ? ?0GImage@@QAE@ABV0@@Z (0) ? ?0GImage@@QAE@ABV0@@Z (0) Core dumped in C:\Users\...\AppData\Local\Temp\000099_Ruse Final_29.dmp for post-mortem analysis. The call stack was copied to the clipboard. Press OK to report the dump by mail, CANCEL to quit. Core dumped in C:\Users\...\AppData\Local\Temp\000099_Ruse Final_29.dmp for post-mortem analysis. The call stack was copied to the clipboard. Press OK to report the dump by mail, CANCEL to quit. 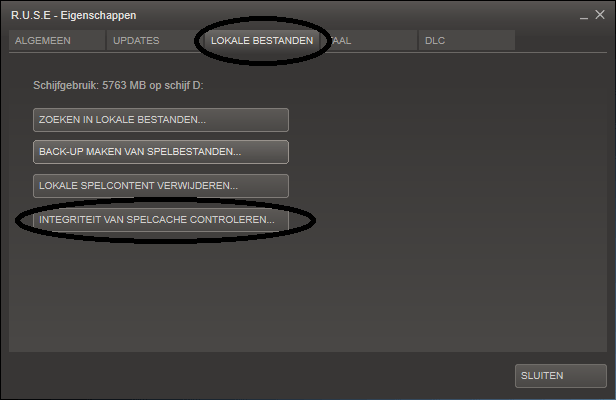 Steam will synchronize your game cache with Steam. When that’s done, your good to go. Enjoy!